On Friday, February 1st we will be celebrating Chinese New Year and the Year of the Pig. This festival has become a highlight of our school calendar and once again, all students are invited to dress in red or in a Chinese costume. Our comperes, Mimi and Milo will be opening the celebrations at 8:40am and parents are warmly invited to attend. It really is a most enjoyable event, so do come if you can. Thank you to you all for helping to resist the spread of the flu virus. We will continue to be vigilant by the monitoring the children and general hygiene but a key factor has been your support in keeping children home who have any symptoms. Children who are not well, are more inclined to pick up these viruses, so please do keep us informed if there are any confirmed cases of flu virus A or B within your family. Recent additional news is that unfortunately we have had confirmed cases of Flu type A amongst the children who were on the residential visit. Health, Safety and Late ArrivalsIt is obviously important for our students to arrive at school on time at 8:25am but we understand that delays do sometimes happen. For everyone’s safety, we do need however to ensure that all students are registered in the morning, so from now on if a student arrives after 8:40am they should go straight to the office to register. We congratulate Christophe in Year 10 who was successful in gaining an A grade in his French IGCSE. On Tuesday 22nd January, our Year 7 and 8 students travelled to Ayutthaya for a 3 day study visit. 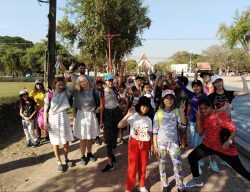 Students had the opportunity to see many historic sites and learn more about Ayutthaya through a variety of activities. We visited Bang Pa-In Royal Palace, known as the Summer Palace, formerly used by the Thai King Rama I and we also had the opportunity to learn more about Ayutthaya at the Chao Sam Phraya National Museum. This wonderful exhibition displayed a number of artifacts discovered during evacuation works and restorations of ancient temples in Ayutthaya. Students particularly enjoyed the boat ride where they could take many photos of the amazing temples. The opportunity to sample the different types of cuisine at the Ayutthaya night market was another great highlight, as was the visit to the Gong Khong market, where students were involved in a welcome dance, before having the chance to buy souvenirs. This year’s Safer Internet Week at HHIS will begin on Monday 4th February 2019. We will be offering the opportunity to highlight positive uses of technology and to explore the role we can all play in helping to create a better and safer online community. We will be sharing advice with all our students throughout the week and we would also like to extend an invitation to parents to join us at 3.45pm on Wednesday 6th, so that we can share best practice and help answer any questions you might have about how we can all work to keep our students safe. The presentation for parents will be in the Year 5M Classroom. We look forward to welcoming you. เราขอแสดงความยินดีแก่ Christophe นักเรียนชั้น Y10 ที่ประสบความสำเร็จในการได้รับคะแนนเกรด A จากการสอบวิชา French IGCSE. สัปดาห์ความปลอดภัยทางอินเตอร์เน็ต – เวิร์คช็อปผู้ปกครอง วันพุธที่ 6 ก.พ. 62 เวลา 15.45 น.